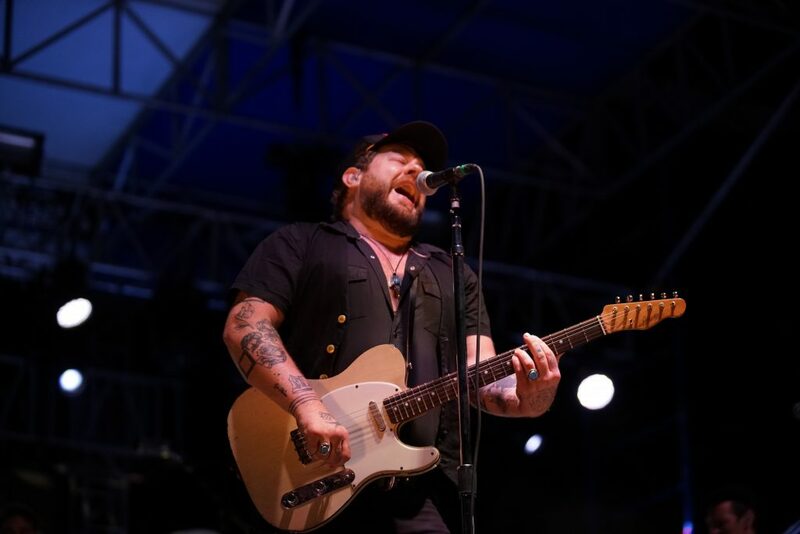 It was warm out at SunFest on Friday night, but much of the sweat was on stage, with powerful performances by Incubus and Nathaniel Rateliff and the Night Sweats. Incubus, whose best-known songs include “Drive,” “Megalomaniac” and “Pardon Me,” played a set marked by strong harmonies, vocal prowess, and extended intros to some of their most well-known songs. During the extended intro to “Megalomaniac”, off 2004’s A Crow Left of the Murder, you could feel vibrations throughout your body, even as far back as the second barricade. Lead singer Brandon Boyd was all about the crowd participation as well, as he held the microphone out for the crowd to sing the chorus. He grabbed an orange beanie for “State of the Art,” off 2017’s 8, which had some of their distinctive bass work. The song had a refined, smooth sound that showed Incubus getting better with age. “Pardon Me,” off 1999’s Make Yourself, also had a meandering intro. Incubus’ songs start out slow and build up to a satisfying heavy crash. “Pardon Me” was no different. Towards the end of the song, Boyd took off the beanie and held the microphone out for the crowd to sing the chorus. The crunchy foreboding opening riff to “Nice to Know You,” off Morning View (2001), is one of those genre-defining things. During this performance, the band’s commitment to its music, and especially its live show, was clear. A prolonged guitar and DJ/programming solo gave the audience a good demonstration of the band’s muisicianship. Nathaniel Rateliff and the Night Sweats, best known for their 2015 single “S.O.B.,” were up next. Their music conjures images of a smoky New Orleans blues/country bar, where everyone crowds in to listen to the singer croon away his or her pain. This is also the epitome of Rateliff and the Night Sweats, though they do talk about relationships, familial and otherwise. They dedicated their song “Say It Louder” to “kids who are willing to stand up to tyranny. We need to leave something for them. When children speak up, they need to keep speaking up even if adults don’t listen.” The song is about finding your way and what you need, not just what you want, even if it’s scary. That light piano and horn in the intro of “Hey Mama” was one of the best moments of the set. It had the sultry jazzy vibe that instantly pulled you in and got you to pay attention. And then there was “S.O.B.” It’s not unusual that a song where the singer swears in every chorus has found mainstream success. What is surprising, for one, is that the song is about Rateliff detoxing from alcohol and the delirium and shakes he experienced. For another (and more hilariously), an instrumental version of the song was used in an iced tea commercial that emphasizes family fun and togetherness at a picnic. Rateliff so effortlessly controlled the high and low notes you could feel the lyrics in your soul. An impromptu saxophone solo midway through the song only solidified that New Orleans blues/jazz feel. The band left the stage after its set and came back for a three-song encore that included Rateliff dancing and organist Mark Shusterman also playing tambourine. The second song of the encore, “Tearing At The Seams” was a ballad full of longing in every aspect, especially in Rateliff’s gravelly voice. He seemed to caress each vocal run. A couple was even slow dancing. Those who stuck around for the encore seemed reluctant to leave, which only speaks to how strong the night of music was.